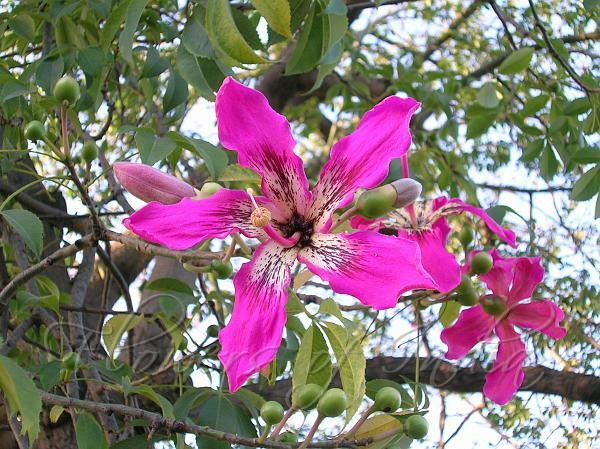 Floss Silk Tree is often rated among the most beautiful trees in the world. Also called Silk Floss Tree, this deciduous tropical from Brazil and Argentina is a large tree rated to over 40 feet. Floss Silk Tree is also well known for the large spikes protecting the trunk and limbs. 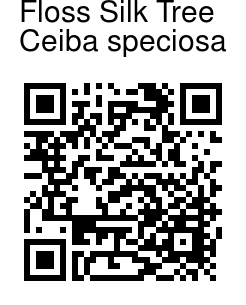 It has pale green leaves palmately divided into 5-7 pointed leaflets. The young trees start out growing fast, straight, and narrow, then slowly develop broadly spreading umbrella canopies as they age. Silk floss trees typically drop their leaves just before they put on their spectacular autumn display of large five-petaled flowers. The petals vary from pale pink to rose to purple or burgundy at the tips and grade into ivory with brownish spots or blotches at the base. After blooming, pear shaped fruits appear which have a silky floss on the seeds, hence the name.